Interview with Greg Gomez conducted August 2010. The Gomez brothers had a destiny - at least according to their father. "He wanted us to work at CF&I (steel mill), and follow in his footsteps," said Greg Gomez. But the siblings had other ideas - they wanted to make music. Right after graduating from Central High School Greg, and his younger brother Charles, formed a band, Abraxas (after the Santana album). They enlisted Dave Carleo on keyboards, Denver bassist Joe Garcia, Albert Vargas on trumpet, and Frank Montoya on guitar. "I played sax and did lead vocals, and my brother was on drums," Greg said. Soon the band, and their brand of Colorado funk, was hitting the road, playing clubs throughout the state, as well as Arizona. "We were doing everything from Parliament to Funkadelic to the Gap Band," he said. As their popularity grew, it became apparent that they would have to rename the band. "We thought we would get some negative feedback from people who thought that we were a Santana cover band, or something. 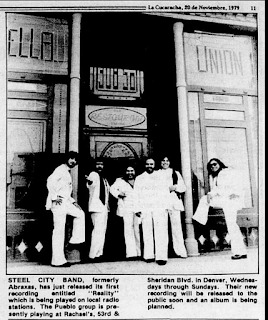 So we decided to change our name to The Steel City Band - after where we were from, Pueblo." In 1979, in an effort to receive more exposure, and land nationwide gigs, they decided to record a single at Boulder's Mountain Ears Studio. Fronting the $3,000 to make the record was their once skeptical father. 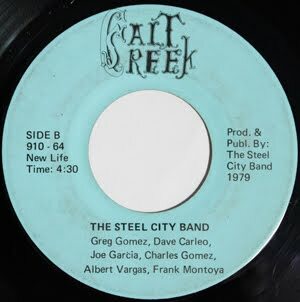 The single featured the disco Latin soul A-side, "Reality," written by Greg Gomez, and its flip, the Dave Carleo-penned "New Life." "We only had $3,000 to make the record and get it distributed," Greg Gomez said. "$1,500 to do the recording, and with what was left, we got 5000 records pressed. We sent them out to radio stations. We were pretty naïve about marketing. We gave some away, and sold some. At a parade in Pueblo, we just handed them out." The record was pressed on the band's own Salt Creek label, named after their hometown, near Blende. "Reality" received extensive airplay on the West Coast where, according to Gomez, it shot up to number one on one Los Angeles radio station playlist. "Then things just started happening. We did a world tour, we went to the Middle East, we played Vegas." While playing a gig in Las Vegas, a member of the Hilton family asked the band if they would be interested in performing in his Reno hotel. The job was to be the warm-up act for Sonny Turner (former Platters lead singer). "Sonny liked the way we played. We were originally booked for two weeks, and it ended up being a couple of months." The constant touring took its toll on some of the members of the band. "Some of the guys got homesick for Pueblo and left, some guys met girls and got married. We added new members and just kept touring," Gomez said. 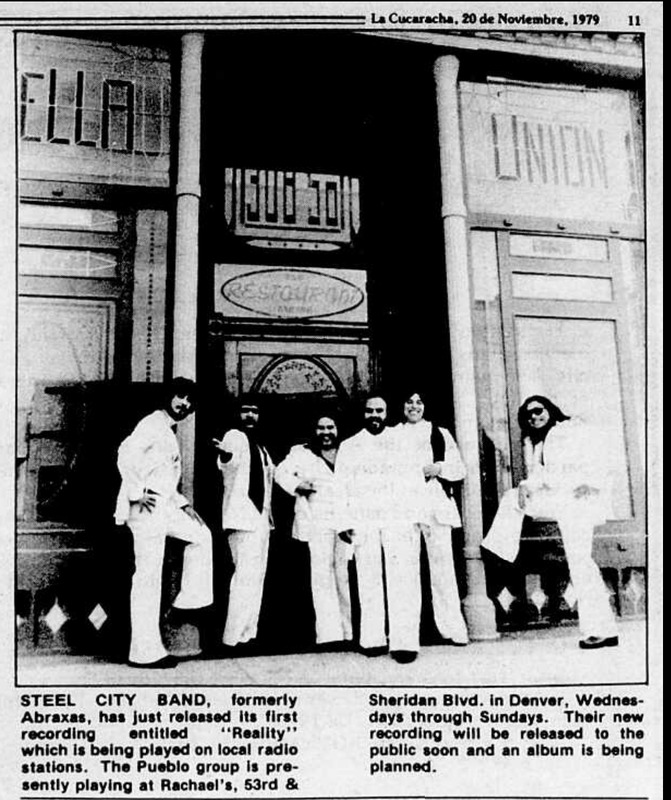 The group would go on to tour the Philippines, New York, and the southern U.S., as well as a regular gig at the Ramada back home in Pueblo. Currently the Steel City Band is made up of the Gomez brothers, who still perform around southern Colorado. The brothers have also recently reformed the Abraxas band, with Rob Smith, Louis Lucero, Felix Cordova, and original members Dave Carleo, Carlos Crull, and Dave Vega. On Sept. 25, 2010 Abraxas headlined the annual Pueblo Chile and Frijoles Fest. The Steel City Band's original single is also considered a rare private issue Latin soul/funk collectible - at least according to recent eBay auctions. In June 2010, a copy of the record sold for $349 (it previously sold for $280 in June 2008).